I couldn't follow the market today so you can imagine that I was very pleased when I came home to see that the markets hardly moved today. Above count is still very speculative. What we need is a rally above this week's high at 1328 and then a rally above the 1340ish area. If we get that then the count looks pretty good. 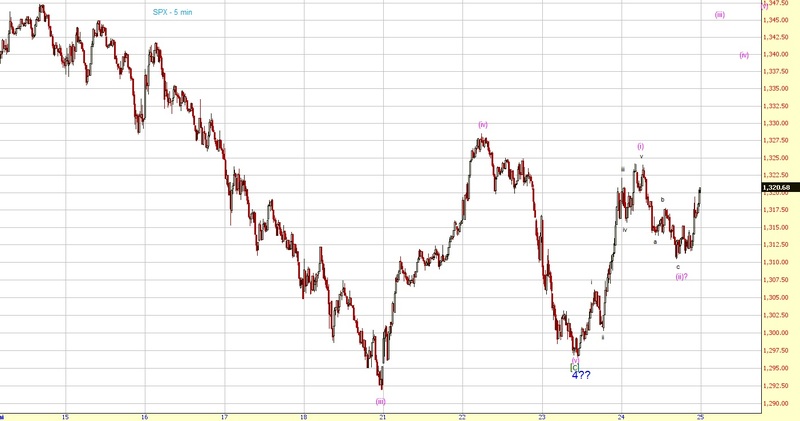 A reader pointed out that we could be in a wave (iv) triangle. If you look at the chart above you can clearly see a potential triangle since Monday. So it's definitely something we have to consider, especially if the market declines tomorrow.